I've see a lot of large sentiment stamps and I love them all. And I've seen watercolored backgrounds and I love those too. 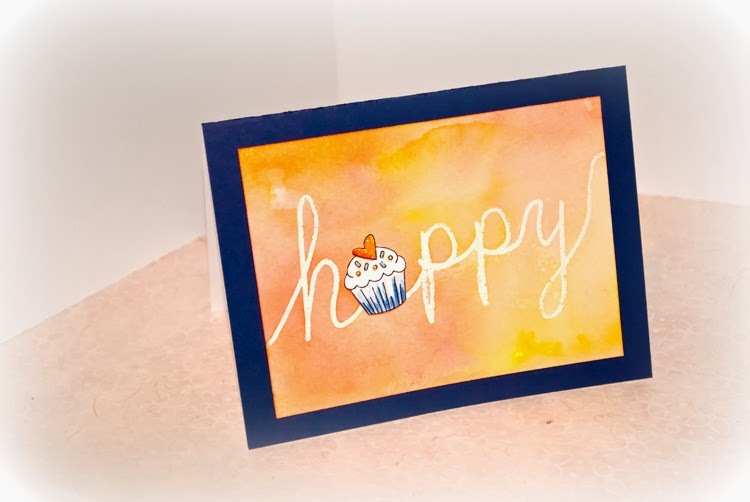 So I set about trying to get a large sentiment with a watercolored background without buying any new supplies. Hmm...a Versamark pen, clear embossing powder, Distress Inks, and watercolor paper. Done! 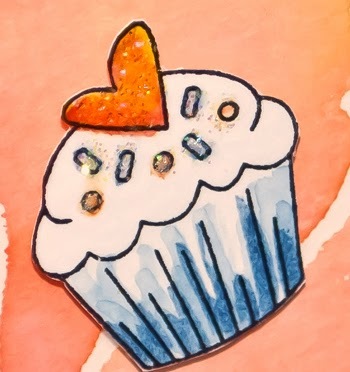 Since this is a birthday card, I decided to watercolor a little cupcake, cut it out (look, no die) and pop up. Adhered it all to a navy card to set it off. Would I have preferred a new stamp set? Absolutely. In fact, an image of happy would look better. But this works and my handwriting is free. Love free! I'll practice a more because I think I can get an even better look if I write faster and looser. Should be fun. Really fun card. Your handwriting looks great. My handwriting has always been poor and I've always been envious of people like Dawn McVey on PTI. Way to use what you have. I think we should all do that first before we buy more. I love how this turned out. Hope you share any other cards you make using this technique. Thanks for a fun alternative idea! Very sweet! Or should that be icing on the cake! Absolutely adorable. I used to do beautiful calligraphy but like everything if you don't practice you lose the abilty, now I dislike my writing. I love how your card turned out. It makes me happy too! Fooled me! I could have sworn it was a stamp. Looks great, Joan! Clever girl!! I'm soooo trying to use up my stash of stuff versus buying new!! I will have to practice my handwriting skills (HATE my handwriting) so that I can avoid purchasing those large die cuts that I want!! I love this! Love the colours that came out as the watercolour dried! I really like your watercolour background, Joan. Funny how things come around - I have a set of embossing pens that I used to write and emboss greetings inside cards from way, way back. But unlike you I wouldn't be brave enough to make a feature of it on the front of a card. ITA with not needing dies for everything - some things are fine to fussy cut if you don't need twenty of them!! !